Continuing posing through The Apostle Paul and the Christian Life: ethical and missional implications of the New Perspective leads to a chapter by Lynn Cohick of Wheaton College called ‘The New Perspective and the Christian Life in Paul’s Letter to the Ephesians’. The lens into these questions for Cohick is Ephesians. She begins by contending that while the sins forgiven aspect of Paul’s gospel has been front and centre, the communal and transformational flip-side of his gospel has been muted within the church. This was a fusion of ethnic, religious, cultural and political identity with Judaism of Paul’s day – expressed in various ways among sects like the Pharisees, Essenes, Zealots, Sadducees etc. And in this, she argues, Jews were quite typical of other religious identities of the ancient world. In Ephesians, there is not a contrast between the narrow, ethnocentric, legalistic Jewish identity as opposed to the abstract, neutral and broad Gentile identity. The disaster within Christian anti-Jewish rhetoric is where the ‘Jew’ “who represents the pride and arrogance that plague humanity.” The benefit of the NPP is that it has demonstrated that Jews of the first century were no more arrogant than humanity in general and can’t be used as a foil for the ‘humble’ Christian who accepts God’s grace. Paul theologically shifts the doing of the (ritual and cultic) law from a universal mandate for God’s people to a sociological category representing a cultural display expressing Jewish heritage. The Jewish believers continue to practice their heritage but must refrain from insisting that gentile believers within the same community embrace Jewish cultural practices. 2:14 is a revolutionary statement in the ancient world – one new humanity, within one body, through the death of the Jewish Messiah (2:16). Both Jews and Gentiles are adopted into God’s family through faith in Christ (1:15) and both remain Jews and Gentiles. This new humanity foreshadows the inheritance to come in the new heavens and earth – a humanity of diversity and unity. The shocking and radical inclusion of the Gentiles is for Paul a deep mystery (3:6). The gospel challenges the spiritual rulers and principalities that keep their power in part because they separate and destroy; they “build” hatred between peoples rather than tear down dividing walls of hostility. The peace these rulers promote is pacification of the weak by the strong. This is not the peace of Christ, which brings together all members of his body in love. The response is for God’s people to put on the armour of God – this is apocalyptic language and imagery, but the method of warfare is respect, generosity, forgiveness, faith and so on not aggressive, triumphalistic posturing. Paul frames his injunctions to practice forgiveness with his conviction that spiritual evil forces rampage about the world, wreaking havoc and su!ering. Humans are victims of such powerful evil. Paul asks the community to put on their “new self” that is fitted for godly behavior that imitates God and walks as Christ walked (Eph. 5:1–2). This new humanity, Jew and gentile, one in Christ, by its very existence declares ultimate victory over sin and death, and life eternal in the new heavens and new earth for all who call upon the name of the Lord. Cohick offers some interesting observations on the contemporary relevance of the inclusion of the Gentiles is in the ‘nonprivileging of status’ of whatever sort – even that of Western theological traditions, now a minority voice within the global church. The “we” of the American churches needs the “you” of the global South and the Asian churches. The “we” of Paul and his Jewish compatriots is not a “we” of dominance, of paternalism, of superiority; it is a “we” of chronological experience of God’s revealed truth. Today in most US churches, it takes daily diligence to resist the siren call of consumerism, nationalism, and individualism and to embrace fewer material goods and more global church identity. Paul’s kinship language would be a good place to start in renewing our minds and thus our practices and pocketbooks. A goal would be an ethnically and racially integrated local church experience, one that does not privilege one ethnic or racial approach over another. A baby step in this direction might be partnerships between currently homogeneous churches within a city. The danger here is that the wealthier church might call the shots or imagine itself as the “senior partner” of the pair. This same temptation exists when an American church partners with a church in the global South. Paul’s call to be one body requires tremendous restraint of will in the relinquishing of control by the dominant group and the intentional empowering of the least of those in its midst. Ethnic boundaries broken; radically different attitudes between identities forged in opposition to each other; equality and humility as identities are relativised; a new humanity marked by the Spirit, existing as a powerful alternative to the world; peace, unity and shalom – it is this sort of focus and insight that flows from a NPP reading of the text. 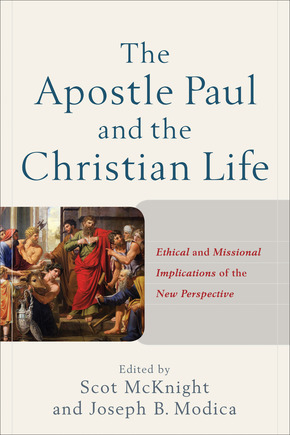 It was a privilege to write a chapter for The Apostle Paul and the Christian Life: ethical and missional implications of the New Perspective edited by Scot McKnight and Joe Modica and published by Baker Academic last month. I’m not going to post about my own chapter save to say it was a hugely enjoyable and personally rewarding writing project. And to be surrounded by exalted company like JDG Dunn, NT Wright, Bruce Longenecker, Lynn Cohick, Timothy Gombis, Scot and others is a bit surreal. Now, I guess I might be a tad biased but I really do think it’s an excellent book. The fresh angle here is how the (now not so) New Perspective on Paul helps in developing an integrated understanding of the apostle’s theological vision. Or, to put that differently, he isn’t writing abstract systematic theology, his overriding concern in his letters is the moral transformation of those under his pastoral leadership. It’s theology written that ‘Christ might be formed’ in individuals who have come to believe the gospel of Jesus Christ. Each author was given a general remit to unpack the connections between the NPP and the Christian life. The result is that as you read the book, a fascinating group of themes begin to emerge. The big question at the back of them all is how does Paul the Jew, – now a follower of Jesus the Messiah – envision a life pleasing to God? How does he see the relationship with Jewish belief and practice of his day [shaped around the Torah] and what it means for both Jews and Gentiles to live a life worthy of the gospel? What are the implications of these questions for living the Christian life in the 21st century? I’m going to post on a few of the chapters. The first is Bruce Longenecker’s terrific essay on ‘Faith, Works, and Worship: Torah Observance in Paul’s Theological Perspective’. The activity of the Christian life includes, says Longenecker, self-giving love, empowered by the Spirit. It means ‘bearing one another’s burdens’ – and this includes economic burdens (see his book Remember the Poor for more). But it’s the background context in which the Christian life is lived that Longenecker brings out wonderfully well. ‘Cosmos Grabbers’ – by which Longenecker means the powers of Sin and Death – powers that reign like cosmic overlords. These powers are ingrained in fabric of the world and manifest themselves chaotically throughout humanity’s all too destructive existence. Where these forces produce disunity and disharmony, Paul has come to experience and see that God’s agenda in Christ is to bring peace, unity and harmony not only for his (Jewish) people but for a new humanity consisting of both Jew and Gentile. For Paul, works of Torah could not contribute to this battle. It is the Spirit who empowers believers to life the Christian life. And this is why he resists wholeheartedly any attempt to insist that works of Torah be imposed on new believers. To try to make Gentiles become Jews is another form of ‘centrism’ that leads to division not to unity. Stripped to its core, then, what Paul was ultimately fighting for when he wrote “not by works of Torah” was nothing other than cruciform self-giving as the overturning of self-interestedness, itself the product and foothold of cosmic powers opposed to God’s program for the world … Paul maintained a vision of those in Christ as a collection of diverse people, united in worship of the One who created distinctly varied identities, whose challenging corporate life can be sustained only through the power of the Spirit, who enlivens other-regard in transformational patterns replicating the self-giving of the Son of God. Reading this is it hard not to be struck by the massive importance of unity and self-giving love within the church for the apostle Paul. What, do you think, would Paul make of the contemporary church? In how it fights destructive spiritual forces with the weapons of love and unity? In how it overcomes ethnic and cultural boundaries that so divide the world we live in? Over at her blog Gladys Ganiel has a summary of a book launch event ‘author meets critics’ (of which Gladys had invited me to be one) in TCD about her recent book, Transforming post-Catholic Ireland: religious practice in late modernity (OUP). Increased diversity in the religious market gives increased space for personal transformation; space is created on the margins where people can work for religious, social and political transformation. The prevalence of extra institutional religion counters hard secularisation theories: it exists as an intermediate space between pure individualism detached from church all together and institutional religious expression. Extra-institutional religion is not totally free-floating, it happens in relationship and community, often with a concern for social justice. Gladys argues extra institutional religion has potential to contribute to reconciliation more than other traditional institutional Christian churches. someone who while still involved locally in a church that he gives thanks for, describes himself as an ‘exile’ within the institutional church. It is an alien place; he is a ‘stranger’ in the midst. How would you describe your relationship with institutional Christianity I wonder? Or, to put it another way, where most do you find authenticity, spiritual refreshment, spiritual growth and learning? Where most do you find space for building relationships across boundaries and opportunities to work for justice? However you read Gladys’ book, the trends and stories within it pose questions to historic denominations in particular – and whose membership is in relatively rapid decline. One response may be to decry ‘extra-institutional’ spirituality as a sign of an individualism shaped by consumerism – religious shopping for the I-generation. A spirituality that all too comfortably side-steps the demands of Christian discipleship – accountability, community, costly mission, a willingness to be rejected and marginalised? But such a response locates the ‘problem’ externally – with those pesky individualists who don’t go along with the status quo. It ignores their passion for serving others, for social justice and a pursuit of community. The better response to a book like this (for churches) is to look within; to listen; to reflect on practice that, in Christendom, meant that churches became what Gladys calls religious ‘public utilities’ dispensing services to all while relegating personal faith and authentic living of the Christian life to the background. I think there are fruits of such self-examination, listening and reflection on practice within some churches in Ireland. Perhaps you know and have experience of some. Places where there is space for diversity; personal transformation; community; a passion for social justice. And it’s here that I find sociological categories too general and abstract. For behind such descriptions of behaviour lie beliefs that motivate and shape that behaviour. That’s why contemporary debates about the nature of the gospel and how it plays out within the Christian life are so important …. Sociological analysis can helpfully describe and interpret trends, but as a Christian I want to argue that spiritual renewal and authenticity comes from a nexus of things like grace, the good news of the risen Lord Jesus Christ, the empowering and transforming work of the Spirit, repentance, faith, humility, love, self-sacrifice, care for the powerless and oppressed and so on. In other words, is the search for authentic spirituality within extra-institutional spaces really a quest and longing for ‘the church to be the church’? Yesterday, Jeremy Jacoub and I sat with feet dangling out of an airplane door 10,000 ft above the north coast of Ireland and jumped out. About 25 seconds of freefall at 120mph through a hail shower before parachuting down (ok gotta admit – we both did tandem jumps)..
Jeremy’s a student at Belfast Bible College, and he, I and Caroline Somerville (librarian) and some of her family were all doing a fundraiser for the College. Overall target of £5k reached – thanks to everyone who donated.